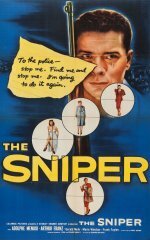 An excellent psychological exploration of what drives one man to shoot at random with no apparent thought or feeling. The man in question has a deep grudge against women and the camera follows his gun as if we, the audience, are his eyes, the effect of this visual trick being both very eerie and strangely compelling. Arthur Franz gives a powerful performance as the madman and this is neither a eulogy to violence, nor a total condemnation of society, but an intelligent movie that poses many complex questions. However it is not to everyone's taste. Edgy crime drama starring Adolphe Menjou and Arthur Franz. A downbeat San Francisco detective tracks down a man carrying out a killing spree targeting women.